Beavers Bend State Park and Broken Bow Lake information: including fshing, hiking, cabin rentals, restaurants, and local attractions. The Broken Bow, Oklahoma area is rapidly becoming one of the most popular vacation destinations in the southern United States. Texas, Arkansas, and Oklahoma nature enthusiasts, sportsman, and vacationers are making the resort area a regular stop on their annual Summer, Spring, and Winter breaks. Those looking for a peaceful weekend getaway have made the area a haven as well. Located in McCurtain county, it is easily accessible from the Dallas and Oklahoma City areas. 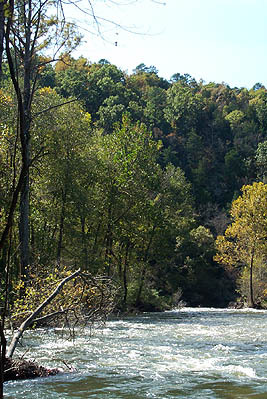 The county's southern border runs along the Red River, while the Northern section rises into Kiamichi Country and the Ouachita National Forest . The vast differences from the rich farm land to the piney forest make the Broken Bow area very unique and picturesque. Located in the foothills of the Kiamichi Mountains, nature enthusiasts find ample activities to immerse themselves in at Beavers Bend State Park. The park, along with Broken Bow Lake, is located about 9 miles north of Broken Bow. From spending a day on the hiking trails or driving north on Highway 259, there is an opportunity for all to experience the beauty of the Beavers Bend area. Most Oklahoma vacations don't include such a variety of wildlife as you will find here. Black bears, bald eagles, and woodpeckers are just a few of the natural inhabitants living amongst the McCurtain County residents. Clean, clear, mountain fresh waters run year round and make fly fishing a favorite for many.The Mountain Fork River also gives an opportunity for those looking to canoe, kayak, or simply get their feet wet. As the season change in the area, so do the activities. 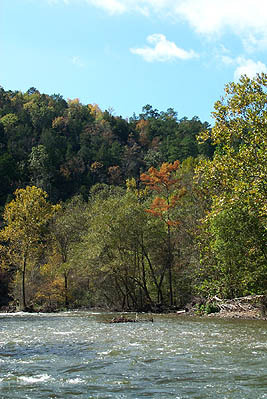 Beavers Bend State Park host many entertaining and educational events. In November, along with the hypnotizing colors of the foliage, you can experience the arts during the Beavers Bend Folk Festival and Craft Show. Summer will bring in flocks of Broken Bow Lake guests, as they jet ski, swim, fish, or simply enjoy the literally untouched banks of the 22 mile long lake. Lodging is abundant in the area. Hotels, RV spots, camping, and Beavers Bend Cabins can be found from Idabel to Hochatown. Reservations for cabin rentals can fill up early, especially during the Summer and Spring breaks. All major holidays will also be reserved at full capacity. Make your reservations well ahead of your planned visit. As Broken Bow and Beavers Bend State Park gain more popularity, activities and business are increasing as well. There is a new Choctaw Casino with over 450 gaming machines. Recreational businesses, such as canoe, kayak, horseback riding, fishing guides, wine making, and boat rentals can be easily found. All of these activities and more can be done in or around Broken Bow and Beavers Bend, OK.